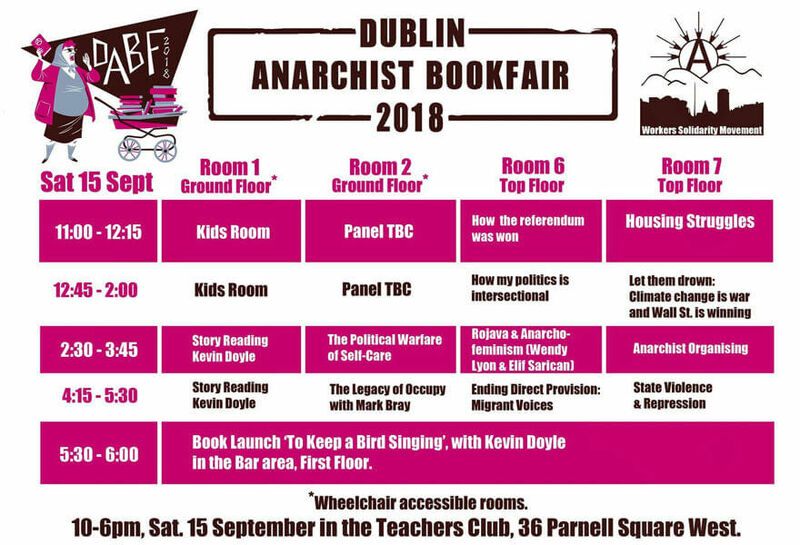 The Dublin Anarchist Bookfair is the largest regular gathering of grassroots activists and campaign groups in Ireland. We always aim to deliver a series of talks and workshops that are both interesting and useful to experienced campaigners as well as those who are totally new to thinking about politics. We also always have a wide selection of stalls & books to browse. The 12th Dublin Anarchist Bookfair kicks off on the evening of Friday 14th at Wynns Hotel and continues on Saturday 15th at the Teachers Club. Every year hundreds of people attend the DABF for a day of inspiring discussions and the opportunity of meeting lots of other radicals, browsing books and meeting campaigns. 8.00pm – Talk: Pushing back the alt-right in the US with Mark Bray author of the Anti-fascist handbook in Wynns Hotel. 10am to 6pm – Teachers Club. Join the Facebook event to let us know you are coming so we can plan for expected numbers and when you do so ask 10 of your friends who you reckon should go.